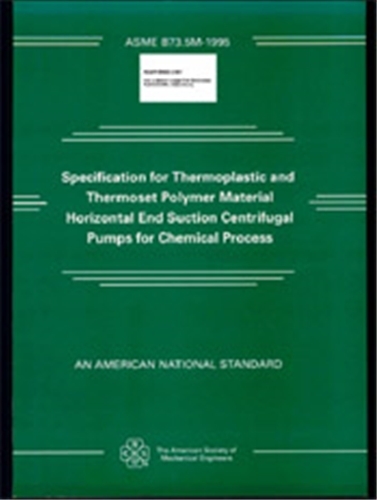 This Standard covers centrifugal pumps of horizontal, end suction single stage, centerline discharge design, which components are made of thermoplastic and thermoset polymer materials either reinforced or non-reinforced. It includes dimensional interchangeability requirements and certain design features to facilitate installation and maintenance. It is the intent of this Standard that pumps of the same standard dimension designation from all sources of supply shall be interchangeable with respect to mounting dimensions, size and location of suction and discharge nozzles, input shafts, baseplates, and foundation bolt holes. This Standard does not include lined or non-polymer components.